ChemRegen is located just East of La Jolla, California, adjacent to the Golden Triangle and "BioTech Beach" of San Diego, California. Approximately 25,000 researchers in academic institutions or biotechnology companies are within 10-15 minute drive to ChemRegen including the University of California, San Diego, The Salk Research Institute, The Sanford-Burnham Medical Research Institute, and The Scripps Research Institute. Downtown San Diego and the San Diego Airport are located 30 minutes south of the Institute and easily accessed via Highway 805 or Highway 5. 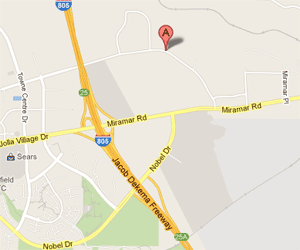 From Highway 805, take the Miramar Road exit and head east, then go west on Eastgate Mall. From Highway 5 take the Genessee Ave exit and head east, then go east on Eastgate Mall.